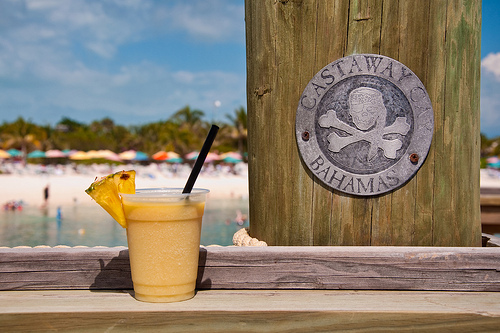 This tasty, tropical drink can be found on Castaway Cay, Disney's private island. When taking a Disney cruise to the Bahamas and Caribbean this is one of the ports of call. This private island has everything you could want, including an adults only area. Add the first five ingredients in a cocktail shaker & shake vigorously. Garnish with a wedge of tropical fruit, if desired. Cook's Notes: Cruzan makes a great coconut rum that you could use in place of the light rum to give it a little bit more of that coconut flavor.